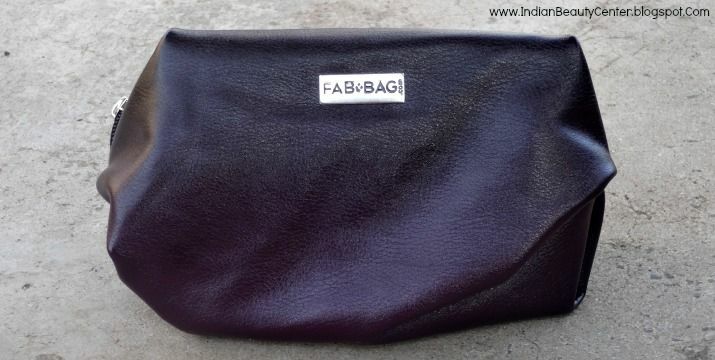 This time it's a really deep purple coloured pouch holding all the products perfectly. I really like the color. It's elegant and pretty. It's a rectangular pouch, looks like a makeup bag. The first product that immediately caught my attention was the Rockstar Eau De Toilette, fragrance made in France for Men. It is a Father's Day Bonus and I kind of like the fragrance. I have given it to my husband and he likes it quite a lot! I guess, I would love to get the full sized product. What I got is just a 1 ml spray. 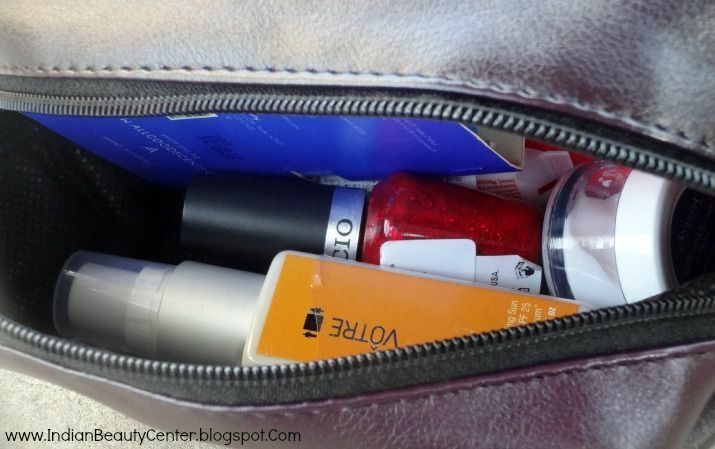 Then, inside my Fab Bag, I found the Cuccio Colour, which is a really pretty shimmery red nail paint. I love the color and this color would go well with sarees. Made in USA, this nail polish is really expensive, at Rs. 675 for 13ml. I got a full sized bottle of this and it's a new addition to my nail polish stash. I had to check the pamphlet to find out that this Cuccio Naturale Butter Blend with pomegranate and fig is a hydrating cream for the hands, feet and body. I have used this a couple of time and it works nicely. But, I think dry hands will definitely need something richer. This is good for the summer months. It has a very pleasant berry-like fragrance. Ananda - In the Himalayas light moisturiser for Oily Skin with juniper holy basil paraben free facial moisturiser was what I found next in the lovely purple pouch. It is watery when spread and absorbs really quickly. I totally love this moisturiser and its fragrance. Although, I don't know if it would cause clogging of the pores. Yet to fully experiment with this. It is a sample sized product with nothing mentioned but the full-sized 50g tub would cost you INR 1350. I quickly checked my bag to find the last product, which was the Votre Fresh Cooling Sun Protection Mist with SPF 25. It is just like water but has an amazing fragrance and offers sun protection to the skin. It hydrates my skin and it's just a perfect travel partner. I find myself using it to combat the dryness due to the heat and it works pretty well in rejuvenating my skin. I got the 50 ml bottle costing Rs. 400. Overall, I am not extremely happy with this month's Fab bag as I was expecting a bit more variety and full-sized products. But, obviously, this bag is not disappointing at all. I am satisfied with it and sure buying a Fab Bag is a great way to try new products and find out what suits you the best! Even better, you can buy the full-sized products on their website. 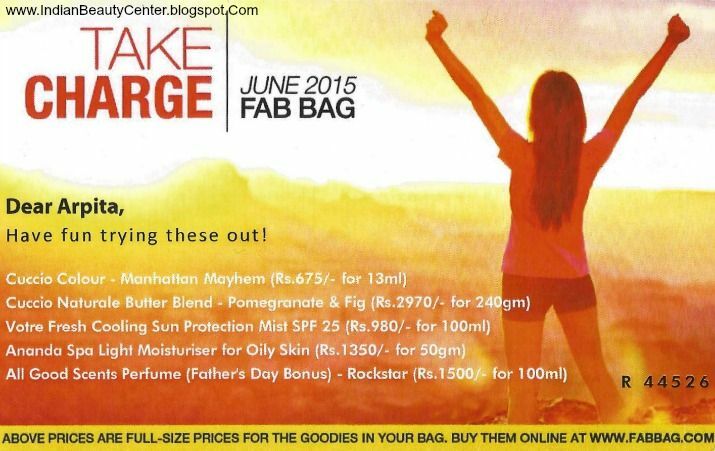 So, what did you get in your Fab Bag this month? At around Rs. 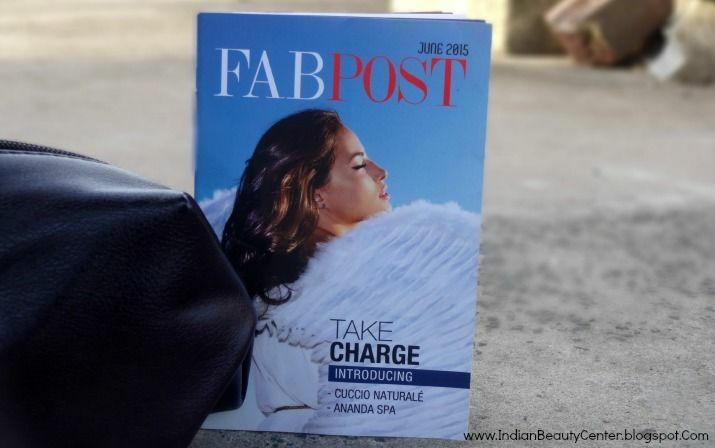 399 per month (if you take the 12 month subscription) Fab bag is definitely a good choice!